If you’re unfamiliar with water beads, here is a preview of these gel crystals that will give you a comprehensive understanding. These non-toxic, colour-fast beads can be used in different scenarios including creating candle holders, filling up bowls with the beads instead of pumpkin during Halloween, and they can be lit up with LED lights to create interesting effects. Water beads are made up of water-absorbing polymers like sodium polyacrylate. Just a 10g packet of dry water beads will make up approximately 1.2 litres after they’ve expanded. 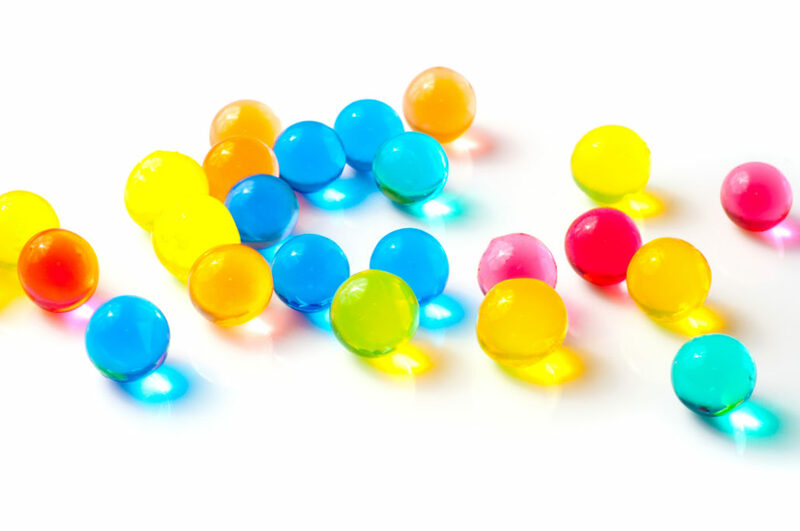 Water gel or beads can be used in many applications depending on your needs. There are lots of ways you can use water beads at home, and a few of the most common are highlighted below. The beads can be used to make air freshener. This is achieved by soaking them in water with a few drops of your chosen scent, for example, an essential oil. The beads will then absorb the water and the scent to become air fresheners. You can place them at different points in the house to distribute the scent. As they are available in many colours, water beads are perfect for home decoration to create a jazzed up living area, bathroom, bedroom, or wherever you want to add some visual appeal. They can be used to grow plants, as when they are exposed to water the beads will absorb it, and then release the water to supplement what is needed by the plant for growth. The beads offer a cleaner alternative to soil and are easily reused. Water beads can be applied in the growing of magic beans. You simply use them to plant the beans and watch as they sprout. They can also substitute marbles when painting. You only need to place a few of them inside a box, then drop in the colours you want, and the beads will create attractive patterns. Where do I find quality beads? To ensure you have good quality beads, you are advised to buy from sellers who have a reputation and positive reviews. That will shield you from buying substandard beads that will not achieve the goals you have in mind. As you can see there are plenty of uses for the beads, so make sure to choose those that will perfectly match your project. Crystal healing is a recent alternative medicine solution that uses stones and crystals to treat ailments and offer protection against disease. Those who support this technique believe that the crystals create a conduit through which healing is achieved by allowing healing energy to move into the body to flush out disease-causing energy. Crystal water beads could be used in energy healing like many other beads, and are also perfect for crystal infused healing. They have various other uses and allow you to explore your creativity. The first benefit of having water beads at home is decoration. They help to enhance the visual appeal of any space. You can use them to create colour themes for rooms in a creative manner. Replacing soil in your pots with water crystals can help you to get amazing results and ensure your planting area is clean. This makes them ideal for planting indoors. Venessa Whitford writes content for Technical Writers. She is a blogger and media manager of online content, who loves to interact with engaging multimedia.